A Rutherglen firm has played its part in the fight against the floods in England. J&HM Dickson, based on Seath Road in the Rutherglen industrial estate, has seen business boom as the flood waters have risen, as they have sold sandbags to the affected areas in the south of the country. Ironically, when the firm was founded in Rutherglen 99 years ago by brothers John and Hugh Dickson, the first product they made for sale were hessian and jute sandbags for use in the First World War. Managing director Alan Dickson said: “Sandbags are something we’ve always sold, but usually if you see them, they’re being used to weigh down road signs. “The events of earlier this year meant there was a three week period where we sold in excess of 100,000 sandbags, when normally we would expect to sell 10,000 during a similar period. “We had them filled and ready to go, but it’s cheaper to send them empty. “We sold a mixture of something like 5-10,000 bags which had been pre-filled with sand, and the rest were just empty bags, going to local authorities, environment agencies and other bodies, who would then fill them with their own sand. “It’s an old product, and the style and size hasn’t changed since we started making them although they’re made of woven plastic these days, but we still sell jute sandbags. “I’ve got a few pallets of sandbags left, but the demand is now starting to tail off. “We’ve also sold quite a few other flood prevention measure products, where a helicopter will lift a bag to stop flooding from above. We’ve sold about a thousand of these. “The bags have mainly been sold around the Kent area and home counties, and to the south west of London. 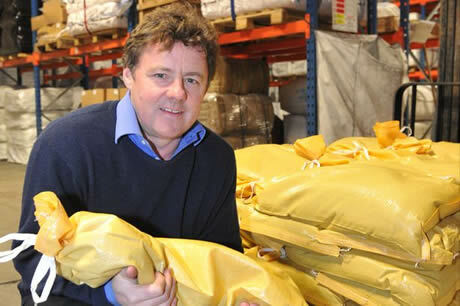 Alan believes that it is the tried and tested simplicity of sandbags which has been them last for so long as a product. He explained: “Of our business, some 80 per cent of it is outwith Scotland, and I’d say 65-70 per cent of it is going to England and Wales. We do a fair bit of business in North America too. “Because we’re in a very unique business, we’ve found the internet is very good at bringing in business for us. Half a century ago there were something like 48 firms still manufacturing, but we’re still going, which makes us a very unique business with a specialist product. Originally operating from a shed in Rutherglen, the Dickson brothers soon moved into three storey warehouse previously used as a bleachworks in Dalmarnock. Both the directors and the workforce of 10 sewing machinists had reserved occupations and were not required to sign up for military service. Dicksons returned to Rutherglen in 1985 and its old factory in Bridgeton has been redeveloped as part of the Commonwealth Games site. The firm currently includes the Royal Mint as one of its customers, making sacks for the transportation of newly minted coins.